Melody Simmons had decided to adopt a dog. Not just any dog, but a French Bulldog, preferably brindle colored. The Miami, FL, woman began searching on Petfinder. About 100 French Bulldogs are listed on the site at any one time, so the odds seemed slim of finding one in her area. Meanwhile a drama had been playing out for a French bulldog mix and her two full-grown pups. Their owner had died, and they had been practically forgotten in a dusty yard in South Florida. They sweltered in the heat for a month before coming to someone’s attention. MJ likes to see what’s going on outside. By the time Big and Small Paws Rescue, based in Plantation, FL, took them in, they were underweight and heartworm positive. They were placed in foster homes and treated for heartworms. Once a vet gave them a clean bill of health, they were listed on Petfinder — just when Melody was in the midst of her search. “Petfinder led me to MJ in less than a week,” she says. “I admit, I thought it would take longer.” She passed the rescue’s screening and, with that, “MJ became queen of my apartment,” she says. Unlike most French bulldogs, MJ is almost silent. “I can count how many times I have heard her bark. 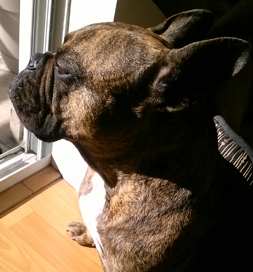 She is even a silent sleeper, which is unusual for Frenchies,” Melody says.